Note: this article was updated in 2019 for accuracy. You know what's a life saver? For not-so-culinary-inclined millennials or busy parents, slow cookers have offered a form of salvation from starvation. Rather than slaving over a stove or oven for hours (or turning to Ronald McDonald) for dinner, a crock pot lets you just set it and forget it. Unfortunately, for us marketers, maintaining a digital marketing strategy and the website that goes along with it, isn't quite as mindless. An effective website and digital marketing strategy is one that is always relevant and up-to-date. In order to be this, you need to be ready and able to make changes to both at the drop of a hat. That's where a CMS or Content Management System usually comes into play. A CMS is a software that enables you to create and manage content on your website including its design, content, graphics, and even code. It's no small task, which is why choosing the right CMS for your digital marketing isn't either. Like your email client or even Facebook profile, your CMS is likely to be something you'll use every single day (possibly even multiple times). With this in mind, the platform you choose needs to be reliable as well as easy-to-use and navigate. To help you decide which CMS is right for you, we've put together a list of the top 10 CMS platforms for digital marketing. If you invested the time and money to integrate all of the necessary components of an effective digital or inbound marketing strategy (i.e. search engine tools, forms, etc.) into any CMS, you would essentially be creating your own version of HubSpot on top of your website. Rather than going through that hassle and cost, the HubSpot Website Platform (an add-on for HubSpot users) gives you all of those features in one tightly-integrated, easy-to-use CMS. The platform offers WYSIWYG (what you see is what you get) page design that requires little to no technical knowledge to edit, built-in SEO, responsive design, cross-browser and multi-device testing, and personalization in addition to the existing HubSpot marketing features. It's a true all-in-one solution and as a Diamond HubSpot Partner Agency, our go-to. HubSpot aside, WordPress is hands-down the best and most popular free CMS available. Since it's introduction in 2003, WordPress has always been a favorite among bloggers for its ease-of-use and open-source flexibility. It doesn't have as many features built-in marketing features as HubSpot does, but millions of plugins to choose from, it does allow you to add virtually anything you can imagine to your website. If you're just getting started with digital marketing or don't need a CMS that acts as a powerful all-in-one marketing platform, WordPress is your best bet. -- Or if you simply love WordPress, HubSpot, Marketo, and a host of other marketing automation platforms have integrations available for it. You may not have heard of Sitefinity before, but, with users like Dannon and Gatorade under its belt, it's actually one of the most established CMS and digital marketing platforms around. One of the most notable of its qualities is its beautiful design and friendly user experience including drag-and-drop widgets, forms, personalization, SEO, A/B testing functionality, built-in eCommerce capability, and accommodations for large enterprises that manage multiple brands, regions. etc. Sitefinity also offers connectors for Salesforce, Marketo, Sharepoint, and Microsoft Dynamics CRM, as well as its own digital marketing tools. Unfortunately, some complaints you'll commonly hear is that the platform doesn't include enough templates and frankly, developers who specialize in Sitefinity are more difficult to find. The choice of Starbucks, Mazda, and Gibson guitars, Kentico is another all-in-one CMS that allows you to build and manage your website, publish content, manage eCommerce, and run marketing campaigns from one platform. In addition to a clean user interface and WYSIWYG editor, Kentico touts itself as the only ASP.NET CMS, and also offers unique community building abilities such as forums, groups, and message boards. International companies will especially appreciate the support of multilingual content, allowing you to manage websites in any number of languages. Lastly, Kentico offers ASP.NET MVC (model-view-controller) support, allowing you to create and store content in the Kentico database using Kentico API that can later populate a web layout customized by your developer separately from your content creation. Mura is a CMS primarily developed for designers, developers, programmers, government organizations, and executives. An open source platform, its goal is to offer a tool that's easy-to-use and encourages maximum productivity. It includes mobile support, search engine optimization, multi-language support, cross-platform flexibility, flexible licensing, scalability, and amongst other things. Although Mura isn't one of the most widely-used CMS, it ranks highly in customer satisfaction. The biggest downside to it is the severe limitation of themes and plugins available as the software is CFML-based. Joomla is a popular open source CMS used by over 75 million websites (and counting). Similar to WordPress, Joomla is free and there are thousands of extensions and themes readily available for you to use. Most people find Joomla fairly easy-to-use, even if they have zero technical experience, but it isn't an all-in-one solution and requires you to do a lot of customization yourself to get all of the features you would normally have in a premium CMS right out-of-the-box. More technical users might also find Joomla limited in capability since it really is aimed more toward people that need a simple CMS without all of the frills. Crownpeak describes itself as a "cloud-first Digital Experience Management (DXM) platform with Digital Quality Management (DQM)." Crownpeak allows you to quickly launch amazing user experiences across various digital touchpoints. 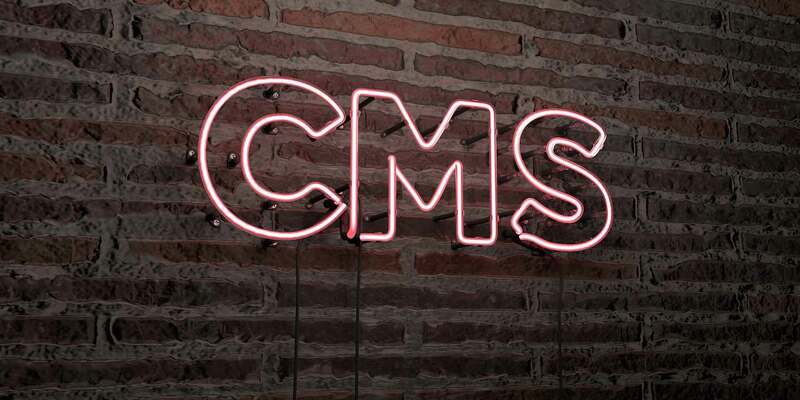 Perhaps the biggest testament to this CMS are the glowing reviews their team has received for their ability to continually improve their product and roll out new updates based on customer feedback. Their CMS is simple and effective, but the platform is a little light on digital marketing features. idev CMS is a simple CMS solution that's designed to scale alongside your business as it grows from a small startup to a large enterprise and users love how easy it is to learn and use. idev CMS uses a WYSIWYG page builder and allows you to easily add new pages, customize content, and build forms. They have a developer-friendly platform with perpetually-licensed source code that allows your developers to customize the framework however you see fit. Some users complain that idev CMS lacks the SEO functionality you find in other CMS software, but otherwise, they are rated favorably by their customers. Now, with its enterprise-level content management with end-to-end content management from creation to archiving, this particular CMS is a robust platform that is best suited for large, established companies. Oracle WebCenter Content provides great support for their customers and consistently maintains the quality of their CMS, ensuring bugs are solved immediately -- unfortunately, this support comes with a price. Given that this is an enterprise-level CMS with a minimum 10-user purchase, people can expect to spend at least $7,590 a year on support fees alone. In addition to the normal content creation and SEO features, Evoq Content supports workflows and personalization, allowing you to deploy robust inbound marketing campaigns with ease, while also maintaining an open source platform and support of highly customizable themes. The biggest drawback of this platform, sadly, is a need for physical resources to support adoption and use. Users complain that Evoq Content lacks training materials for module development. Fortunately, most people rave about the company's knowledgeable support team. No matter which platform you end up going with, remember, it must be able to support your digital marketing efforts either natively or through integration.